Pirate fishermen are driving the albatross to extinction, wildlife campaigners have warned. The Royal Society for the Protection of Birds (RSPB) is appealing to bird lovers everywhere to join the call to crack down on illegal longline fishing. The RSPB says over 300,000 seabirds, including 100,000 albatrosses, die each year because of the practice. It involves boats casting lines up to 80 miles long, with thousands of baited hooks, in which birds get caught up. Conservationists are hoping to collect thousands of signatures urging the United Nations to act against the pirate fleets. If nothing is done, the RSPB is predicting tragedy for the albatross, with 19 of the 21 species in imminent danger of extinction. Dr Mark Avery, director of conservation at the RSPB, said: "This is a senseless slaughter and one that must be halted before we lose albatrosses for good. Experts say bird deaths drop to just a few hundred a year when legal longline boats use measures to keep them away. The UK government has been criticised by conservationists for not ratifying a global Albatross protection treaty, which came into force in February. The Agreement on the Conservation of Albatrosses and Petrels (ACAP) was ratified by Australia, Spain, Ecuador, New Zealand and South Africa. 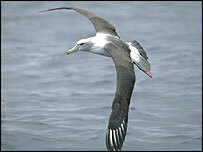 British participation is important as its overseas territories of the Falklands, South Georgia and Tristan da Cunha are breeding grounds for the bird. Dr Avery said: "We need help to force governments to combat the appalling actions of these pirates. "It is astonishing that many, including the UK government, have not done so. "If they do not act, many albatross species face extinction very soon."